Yosso holds a Bachelor's Degree in Recreation Management along with a Masters Degree in Park Management from California Polytechnic State University, San Luis Obispo. For over 10 years, Yosso managed more than 300 park and playground projects throughout California. Yosso is passionate about parks and play area design. He believes that play should be spontaneously selected, individually directed, and inherently educational. As a former NCAA Division I student athlete he holds a record for the most yellow cards in a single season. He now coaches his son, Dylan in the hopes that he does not break Yosso's NCAA Division I record. BTW, Dylan frankly would rather build legos and play piano at age 7. 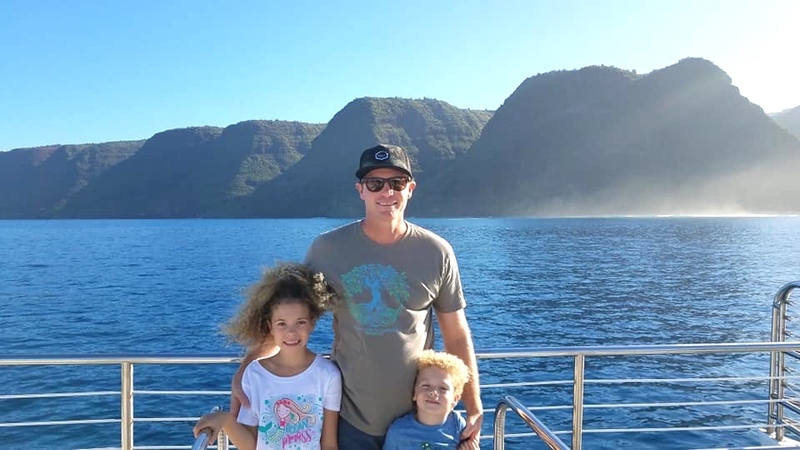 A Bay Area native and current resident of the Livermore Tri-Valley, Chris Olsen brings years of playground experience and passion to every project he works on. Chris' past experience as a social worker helping severely emotionally disturbed children, combined with extensive experience in the customer service field has given Chris a unique perspective on play, child development, and making sure his customers receive the utmost in service and value. During his "down time" you'll most likely find Chris in his kitchen roasting vegetables (the guy really likes healthy food), or possibly visiting the plethora of amazing parks in the region with his wife, Adrienne and 5 year old son, Nicholas (who is also his go to "playground test pilot" and resident "fun consultant") and family dog "Harley". A lifelong Star Wars nerd and Sci-Fi enthusiast, Chris is also a serial optimist who's personal and professional goal is to bring memorable, fun, and enriching play experiences to children (and adults) of all ages and abilities. Sánchez grew up in San José and went on to attend UC Berkeley where she majored in Political Economies of Industrialized Societies and played outside center for the rugby team. Daya brings over 15 years of experience in education and community. She has served in AmeriCorps, taught bilingual fifth grade, migrant education and preschool and worked as a volunteer firefighter and EMT. Daya coaches youth soccer, serves on the boards of two nonprofits and is the author of the nonfiction children's book This is Gymnastics. Daya also has her own team of professional playground testers—her sons Sebastian (shortstop, freeskier) and Dominic (gymnast, ballet dancer), her daughter Adrienne (futbolista, taekwondo blue belt and giant slalom racer), and her husband Stephen (educator and CrossFit rock star). When they're not out competing, Daya and her family love to learn about the world around them through books, outdoor exploration and play. Jeremy grew up in San Jose, CA and now resides in Scottsdale, AZ. He brings 20+ years of key client / national account management within highly competitive distribution networks to the team. By joining 2018, Jeremy seeks to build the across the U.S. starting with Arizona. He's excited to help facilitate the development of amazing gathering places for people of all ages and abilities to play. His passion for providing top notch service aligns with SPEC’s approach on doing business the right way. Jeremy has a very supportive wife and two beautiful children he dedicates his work to. He is an avid golfer, hiker and overall outdoor enthusiast. Marcos is another native of Northern California. He attended San Francisco State University, as well as Sheridan Art School in Canada and Santa Barbara City College. He’s accrued some great experience designing for some leading companies in their spaces. His favorite being at Electronic Arts, a world leading video game company. He knows the value of keeping things in Play and brings that combined expertise to our marketing department and all things creative. He currently lives on a mountain, constructing a wind farm, where he designs in Adobe Creative Suite by candlelight. He has a dog named fax, takes meetings on a Nokia phone and updates our website using a 5.56k modem. Brad Bailey is our licensed structural engineer with almost 20 years of experience doing state, commercial and residential projects ranging from schools and hospitals to single family homes, small bridges, playgrounds and solar arrays. He’s dedicated to meeting the client’s needs; thorough detailing, timely service, economical design, and easy to build solutions. Brad enjoys finding creative solutions to bring the clients' dreams to life, and helping contractors understand our methods during the design and construction processes. When not engineering structures, you can find Brad catching waves, ripping it up on the slopes, or performing at the local saloon in his band. After spending 14 years in the Liquor and Wine Industry followed by 7 years operating a local Beef Jerky and Pickle business, Denise is now happily managing SPECPLAY HQ in Belmont, CA. She brings with her a Bachelor Degree in Environmental Studies with a Political Science emphasis from U.C. Santa Barbara. Denise also leads the SPEC Team as our Sustainability Coordinator. When she’s not placing orders and supporting the SPEC Team, you’ll find Denise volunteering for school projects, helping our son Dylan with homework and visiting family in SoCal, Ventura. She will challenge you to a game of Yahtzee whenever given the chance and is passionate about friends, family, and fun. Specified Play Equipment Company™ was founded by David Yosso. The type of manufacturer's SPEC™ chooses to work with provide self regulated play experiences for all ages and abilities to exercise risk, failure and mastery. SPEC is the Exclusive Partner and Distributor of Berliner, BCI Burke, Lappset, Free Play and mmcité. SPEC hand selects manufacturers that share his philosophy on play, landscape and sport/fitness. In addition, SPEC created Black Locust™ which designs, develops and engineers custom native black locust wood play pieces for truly sustainable, eco friendly, nature based experiences.